As you might have guessed, a significant chunk of my childhood was spent with my nose in a book. While my most beloved childhood/early adolescent picks varied from little women and Civil War belles to teenage equestrians, babysitters, and SoCal twins, I also spent a lot of time with one very fabulous lady named Mary Higgins Clark. Amazingly, the Queen of Suspense (as deemed by her book covers) has written or co-written about forty novels, and I would say I’ve read 20-25 and vividly remember at least half that amount (pretty good for reading them around 12-15 years ago! A testament to the solid and spooky twists and turns featured in each story). 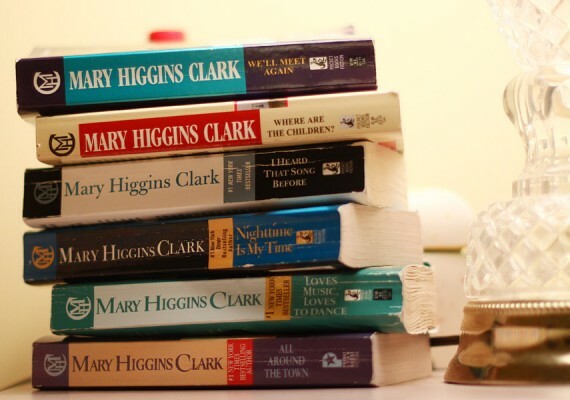 Ultimately, Mary Higgins Clark kept me awake many nights in my twin bed, reading frantically to finally assemble the terrifying puzzle, and then (after finishing the book), hiding under my fluffy comforter and listening fearfully to every little creak in the night! A thrilling and addicting reading experience to be sure. As a quick trip down memory lane, I tried to pick my favorites, listed below. Cheers to you, Mary Higgins – thanks for a childhood filled with murderers, psychos, crazy plot twists, real-life scenarios gone horribly wrong, handsome love interests, and a guaranteed smart, successful, feisty, and intrepid young heroine, all safely confined to the pages of your sleek, compact novels. Where Are the Children? That one red mitten left in the middle of an idyllic, peaceful home life haunted me for quite some time. Loves Music, Loves to Dance. Got to be one of my absolute favorites, and the plot of a journalist tracking down a personal ad serial killer holds up extremely well in this Internet and dating-website age. The Cradle Will Fall. Word to the wise: do not read if you have a major surgery coming up. That hospital scene will hopefully someday fade in my memory! All Around the Town. When I was perusing Mary’s website and read this title, I audibly gasped and felt a little sick. So yes, I still have a dramatic physical reaction to a book I haven’t read in probably 15 years. The story of a former kidnap victim/current college senior with multiple personalities that has been accused of killing her English professor is quite a doozy indeed. Weep No More, My Lady. The murder of a movie star and the setting in a luxurious spa coupled with the fact the the heroine is from Kentucky, my former home, made this one an instant favorite. And of course, the title is from the state song, My Old Kentucky Home, which I obviously thought was just super cool. A Cry In The Night. To me, this was basically The Shining, and I mean that in a very good way. It’s giving me chills right now just remembering the single, young, art gallery working, citified heroine with two young children that marries a mysterious, handsome artist and immediately begins a new life with him on his isolated, Minnesota farm. Thankfully I blocked parts of this one from my memory as I myself ended up marrying a handsome artist (lacking the homocidal tendencies, of course)! Let Me Call You Sweetheart. A plastic surgeon giving multiple girls the same face – the face of a murder victim from years early? You know that story’s going to have some major twists! Remember Me – Let’s just say I always check for safety multiple times before crossing railroad tracks. Mary Higgins Clark has made me THAT obnoxious driver. Did you read and love Mary Higgins Clark as well? If you have an old copy, snuggle up by the fireplace (after the cute kids in costumes stop by, of course), pour a nice cup of hot chocolate, and join me in reliving some of the tricks and treats of America’s favorite Queen of Suspense. Happy Halloween and happy reading!